Despite the presence of a brilliant nearly-full moon, skywatchers should pay attention to the northern sky tonight. If nature is in a showoff mood, for the second time in less than three weeks, a nice display of the Aurora Borealis — popularly known as the northern lights — may flare up. The potentially dazzling northern lights display is possible because of solar flares, which are tremendous explosions on the surface of the sun. In a matter of just a few minutes they heat material to many millions of degrees and release as much energy as a billion megatons of TNT. On Wednesday (Nov. 9) at 8:35 a.m. EST (1335 GMT), a long duration M1 flare erupted on the sun, again in close proximity with an eruptive solar filament. Shortly thereafter, satellite imagery indicated a full halo coronal mass ejection — a massive burst of solar wind containing up to a few billion tons of plasma —lifting off from the sun and apparently directed toward Earth. That subatomic material is expected to arrive sometime this afternoon or evening and potentially could spawn another significant auroral display tonight. Unfortunately, there are no promises. The approaching plasma cloud might only give our planet a glancing blow restricting views of the northern lights to high latitudes. The northern lights are commonly visible over the polar regions since they generate from a belt that wraps around the Earth, going through northern Alaska and Greenland. But as was the case in October, the lights can sometimes be seen much farther to the south in the aftermath of significant solar disturbances such as solar flares and eruptive filaments. Although it is impossible to predict the exact time, zone of visibility or occurrence of the lights, viewers should periodically check tonight’s northern sky, especially if you live across the northern United States or Canada. But nothing ventured, nothing gained. The fact that the bright moon will also be in the sky much of the night will be a handicap, but if a particularly bright aurora develops, it could show itself in the form of arcs, rays or streamers that would include greens, yellows and reds. When it comes to solar flare-driven auroras, as Yogi Berra might say: "It's déjà vu all over again." On Oct. 22, a long-duration M1 solar flare was observed near the west limb of the sun. In close proximity to this flare appeared an eruptive solar filament; a huge tendril of magnetic plasma which subsequently collapsed with explosive results when it hit the stellar surface below. The result was a massive coronal mass ejection. Two days later, when this cloud of subatomic material interacted with Earth’s magnetic poles, it produced a spectacular, albeit short-lived display of the aurora borealis, which was seen as far south as Arizona and Alabama. For many, this particular auroral display was unusual in that it appeared predominately red, due to large numbers of electrons colliding with oxygen atoms at altitudes 120 to 300 miles (200 to 500 kilometers) causing them to emit predominately pure red light. 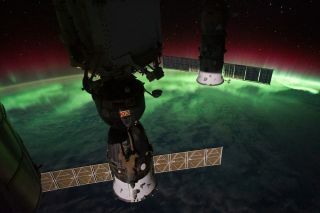 If you snap a stunning view of the northern lights and would like to share it with SPACE.com, send images and comments on the view to managing editor Tariq Malik at: tmalik@space.com.